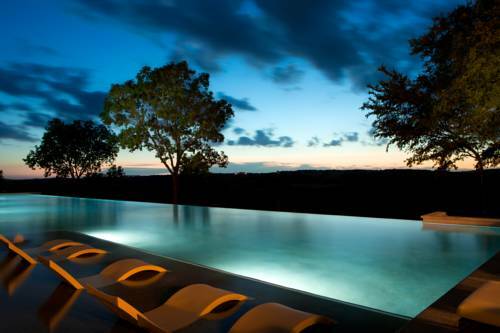 Situated atop one of the highest points in all of San Antonio youll find La Cantera Resort and Spa. Its a place where peace and tranquility flourish. Where emerald fairways and five sparkling pools are the only things interrupting the scenic vistas overlooking the Texas Hill Country. A place where youll find a new sense of relaxation whether youre staying for business or for a well deserved vacation. Only twenty minutes from the San Antonio International Airport and offers a complimentary shuttle to the citys finest shopping and theme parks. Welcome to La Cantera Resort and Spa. Quenche Juicery: Handcrafted cold-pressed juices mood-enhancing Lotus Wei elixirs boosting breakfast preparations and perfectly portioned lunches are all the conscious result of a collective passion for satisfying the soul through fresh and seasonal ingredients. Grille 254: Patrons can expect scratch food offerings a full bar and craft cocktail menu and 24 beers on tap to cool off after a round of golf or unwind after a day in the office. Live broadcasts of all major sporting events on one of many extra large 4K TVs. SweetFire Kitchen: Enjoy a twist on regional home-style cuisine at SweetFire Kitchen where we feature a wood fire oven and seasonal ingredients. Enjoy sweeping views in a private dining room or on the lanai overlooking our Plaza San Saba courtyard. Jaspers at the Palmer Course: Jaspers features appetizing club bites to enjoy after a round of golf on the challenging Palmer Course. Signature: Our Award Winning fine dining French inspired cuisine. Enjoy a decadent glass of imported wine and European decor while our chefs prepare delectable dishes in the open kitchen. Bocado: Grab a charcuterie board to-go at Bocado in the lobby to enjoy on Plaza San Saba or in our Sire lobby bar. Bocado features authentic cured and smoked meats as well as gourmet cheeses and other signature bites. Primero Cantina: Our casual Tex-Flex restaurant features a twist on Tex-Mex favorites. With multiple televisions you can catch your favorite team in action while enjoying delicious eats in a relaxed restaurant right near the pools. Topaz: Enjoy sophisticated drinks and healthy poolside cuisine at our adult-only pool bar and grill. Vista Grille: Casual American fare from Vista Grille located at the resort pool will please the whole family. Henriettas Market: Henriettas features grab-and-go options including barista-made coffee and pastries as well as homemade ice-cream. Sire: Enjoy upscale craft cocktails and impeccable small plates in our lobby bar. San Antonio Grand Ballroom: Divisible into 9 individual meeting rooms. Additionally offers a grandiose 6500 square-foot pre-function foyer and terrace offering stunning panoramic views of the resorts two brilliant golf courses. If you want to wander away from the resort for a few hours or an entire day there are a variety of San Antonio attractions nearby to suit every taste. These thrills and premier shopping are just minutes from the resort. Just a short drive away from Sea World Downtown San Antonio The Alamo San Antonio Riverwalk Wineries of Fredericksburg Complimentary transportation to The Shops at La Cantera and The Rim Shopping Center and Top Golf and Six Flags Fiesta Texas and the Palmer Golf Course.